I'm thoroughly digging She-Hulk. She's struck out on her own, hanging a shingle and bringing in clients, both super and mundane. It gives her comic an episodic feel, while providing superhero action in a variety of settings. (And any comic that passes the Bechdel test is a winner in my book.) Spoilers below! So! Ms. Walters' latest client is an inventor who's looking to market the 'Shrinko', a handheld shrink-ray intended to make shipping large objects a breeze. (An idea possibly borrowed from the first episode of the TV Series, Honey I Shrunk the Kids.) Rufus is ready to mass-produce the gadget, but he needs his partner to sign off on it. Jennifer wants to consult an expert on size manipulation, and calls the original Ant Man. She tells him about their plan, and his response is perfect: "Do not do any of the things you just said you were going to do. I'm on my way." Cut to Reza's back yard. 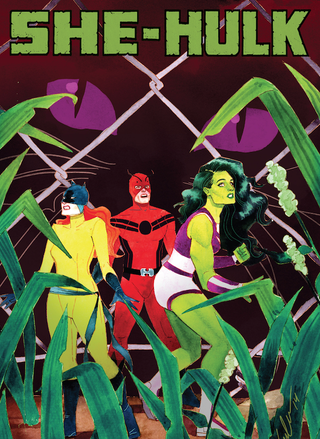 Ant Man, She-Hulk and Hellcat are dressed to work, and go about cutting themselves down to size. At which point, Hank delivers his warning: at three centimeters tall, just about anything can kill them. Including the shrunken Reza, whose molecules are ticking time-bombs. Hank's all set to put on his Ant-Helmet to talk to the locals, when he literally falls prey to one of the things he warned our girls about: getting snapped up for birdy lunch. This is a good time to mention that this issue borrows heavily from Honey I Shrunk The Kids. That's not a crime, the movie's 25 years old. And if you're gonna shrink yourself down to have an adventure, your client's back yard is as good a place as any to do it. Still. She-Hulk's noggin is too big for the Ant-Helmet, so Hellcat puts it on. She messes around with it, insisting she can figure it out. Unfortunately, the only thing she manages is to get the attention of thousands of ants, who stampede. She-Hulk grabs Hellcat and super-jumps them to safety atop the barbecue grill, where they have it out. Hellcat can be careless, impulsive, and prone to leaping before she looks. Jennifer considers her a bit of a screw-up, although she's too nice to say so (most of the time). The Jolly Green Ex-Giant deduces that Reza's hiding in an empty soda can— based on the interest three stray cats are giving it. She leaps into action, leaving Hellcat to catch up and help out... somehow. b) crossed a few miles' worth of terrain in roughly five minutes. Regardless, there she is to distract one of the cats with a sharp jab in the rear. They secure Reza's safety, just as Ant Man returns— riding atop the bird that snatched him off the ground. Once restored to their natural size, Ant Man proves that Reza's Shrinko gun still has kinks to work out. Back at Jennifer's office, they work out the contracts when Jennifer's landlady arrives with news: There's a visitor in the lobby... an aged, de-powered Captain America. Holy smokes. And that's chapter 7! There's a lot to like about the issue. The plot moves along at a fair clip, and Javier Pulido's artwork is unlike anything else in Marvel's stables, right now. (Though I'd also love to see more of Kevin Wada's work, who turned in the dynamite cover.) The dynamic between She-Hulk and Hellcat is feisty, but respectful. These are two fleshed-out women with their own personalities, who don't always see eye-to-eye. It's good stuff.